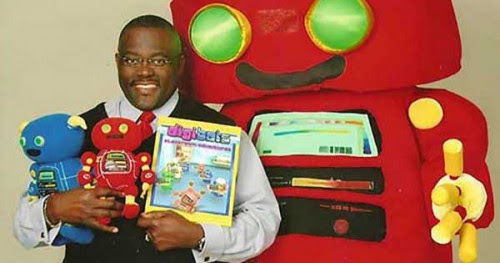 *Digibots (www.Digibots.com) are a unique concept created by African American Dyke Robinson, who developed this innovative toy and publishing company to address inappropriate behaviors in the classroom for school-aged children. Inappropriate classroom behaviors are the leading cause why classroom instruction does not occur. His goal is to make this product, digibots, accessible to every child on the planet. He wants all of them to have a copy of the Digibots Classroom Adventure series in their possession. The series consist of a Digibot Teacher and six students: Kelsey, Shelby, Lisa, Lee, Hong and Jason. This powerful and compelling concept addresses issues in the classroom like: name-calling, cheating, disturbing other’s property, speaking without raising your hand, wandering around the classroom, tardiness, turning attention away from the teacher, fighting, uncontrollable laughter, sharing, inappropriate tasks during lessons, and temper tantrums. Digibots were designed to be used by schools, churches, daycares, home school facilities, parents, grandparents, or any and every entity that has a child in a learning environment. Children from the ages of 4-8 years old will really enjoy the stories because they involve creative thinking, discussion and participation, and the images are very colorful in the books. Furthermore, the characters are placed through-out the stories to keep the child’s attention. Digibots Classroom Adventures I & II can be found on Amazon. Dyke Robinson, the founder and creator of Digibots, has a Master’s Degree in Guidance and Counseling and he is very committed to helping children function properly in the classroom environment. Dyke Robinson says he believes that Digibots will one day change the classroom environment for all children on the world stage. “ Kids just love Digibots,” he says.